Work hard. Work smart. Enjoy the journey. Baltimore, MD -- According to the Ewing Marion Kauffman Foundation there are approximately 10 million Americans involved in starting a new business at any given time. With that reality in mind, millions of people will take their first courageous steps on the road to self-employment--only to lose their footing when they encounter unexpected obstacles in the path. The statistics don't lie: an estimated 75% of new businesses will fail. The overwhelming majority of those will close up shop within the first six months. Clearly, the mere possession of a great idea, product or service does not ensure a successful outcome. 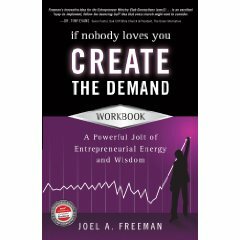 In his new book, If Nobody Loves You, Create the Demand: A Powerful Jolt of Entrepreneurial Energy and Wisdom (Authentic Books), author, speaker and business coach Dr. Joel Freeman provides the skills and tools necessary for individuals aspiring to create a new business on a limited budget. If Nobody Loves You, Create the Demand is written mainly to benefit those who are in "the early-to-mid stages" of ramping up a new business. Drawing from personal experience, Joel relates the harsh realities of starting your own business, sharing his secrets to developing a business plan, creating a brand and marketing a new company. Although the book is tailored to the needs of those embarking upon the entrepreneurial journey, seasoned professionals could still profit from Freeman's perspective. As the mentor/chaplain of the NBA Washington Bullets/Wizards for 19 years ('79-'98), Joel provides readers with the advantage of learning from his own past mistakes and triumphs. "What you are reading has been formed in the crucible of painful experiences," he states. "And it works. But not without a few failures along the way. Truth be told, I have learned more from my failures than from my successes. I am writing this very honest and open book as a wounded healer--providing some skills, tools and creative ideas for charting a course through the dense fog that often obscures the path to entrepreneurial success." In a genre often characterized by clichéd rehearsals of generic ideas, this reader-friendly book is a standout. With six books in 28 languages under his belt, Freeman stirs up the perfect blend of inspiration, personal vulnerability and practical application. Each chapter includes a section entitled "Vision Rich, Cash Poor" that provides specific, detailed advice for creating and sustaining a business on a shoestring budget. Freeman also produces a list of recommended resources that will enable readers to put his suggestions into practice. (1) personal vulnerability – business failures and successes are honestly and realistically discussed, providing a reading experience to which the average person can relate. No pie-in-the-sky. (3) practical wisdom – down-to-earth advice for people with limited finances and big dreams, a series of self-coaching questions…and so much more. (5) addresses the typical pressures that the entrepreneurial pursuit places upon family life…especially the first 3-5 years of starting a business. A beautiful coin for entrepreneur club members. Interested in learning more? "Freeman, an author and entrepreneur, brings his series of popular seminars to book form with this cleverly titled book. It's chock full of advice for the small-business owner: how to market yourself, how to build an effective Web site, how to figure out what you're going to charge for your services, how to build influence and win friends. Freeman writes colloquially, almost like he's giving readers a seminar in book form, so it's easy to digest the lessons he's trying to provide." Joel Freeman has once again done what is so customary of him--provided us with a powerhouse of wisdom in practical, consumable bites. This is vintage Freeman--straight from the heart; always the best. Joel Freeman has done it again! I saw Joel speak at a conference four years ago and was very skeptical. I wasn't sure if he was one of those PhD's whose content was all theory-based or whether he could speak to me on "real life" terms. Boy was I impressed! Not only does Dr. Freeman give step-by-step instructions for business success, his information is actually entertaining and witty. You owe it to yourself and your bank account to read this book! 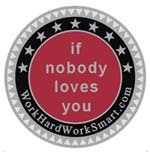 If you are getting ready to start a business "If Nobody Loves You Create The Demand" is a tremendous resource! There are countless tips, thoughts and ideas that will help you gain a better understanding of how to succeed on your own. This is an easy and quick read. Your creative juices will be flowing after your have read this book! Real talk, must read for trailblazers everywhere. Dr. Freeman and If Nobody Loves You... found me during the budding stages of my business. It took me all of two days to read it cover to cover. I found the book in stark comparison to most business reads refreshing and lively. A straight shot for anyone thinking of, or actively pursuing, their enterprise dreams. I go back and reference it every now and again, when I need that occasional "jolt of entrepreneurial energy and wisdom". Like a good shot of espresso, this book will get you going! 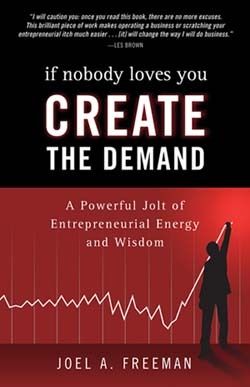 If Nobody Loves You, Create the Demand is truly a powerful jolt of entrepreneurial energy and wisdom. It's a clear and effective outline of countless ideas and concepts that everyone in business can use to effectively create demand for products and/or services. It's easy to read and packed with useful tips and tricks that you can really put to work. And, it's a great refresher for those who are out of ideas or looking for a nice jump-start in activity. I thoroughly enjoyed it! On of the best books I ever read this year. In line with Napoleon Hill's "Think and Grow Rich", this book "If Nobody Loves You Create the Demand " is loaded with great practical advises and strategies that will lead anyone to his or her financial destiny. Dr. Freeman presents here a book I wish I had before I went for my MBA. I strongly recommend this book to an Entrepreneur. The book takes a relatively hard topic to write about and makes it enjoyable. Joel uses his own experiences to help guide you to where you want to be. Whether you are a successful business person or someone just starting out, the lessons in this book are applicable to all. I hope you enjoy reading it as much as I did. Q. Where did you come up with the title and how does it fit into the message of the book? A. Gary Paxton, the creator of The Monster Mash, Alley Oop, Cherry Pie and He Was There All The Time, also wrote the song “If Nobody Loves You, Create The Demand” done by The Blackwood Brothers. I had never heard the song, but the title intrigued me for years. And it was kind of a motto for me for many years when the business side if things got a bit tough. When the concept of this book developed that particular title was the only one I would consider for this book. It captured the intent and the essence of the book. Q. Numerous recognized experts have endorsed this book such as Steve Forbes, Les Brown, Ken Blanchard, Ben Carson and many others. What makes this book so different that these experts have had such a positive response? A. This is not a formula book, with a get-rich-easy-and-quick theme. My experience, along with the many other entrepreneurs I admire has been quite different. I have a specific resistance to the “millionaire minute” approach to the entrepreneurial journey. I think that it is committing literary malpractice to export that kind of a philosophy. In contrast, this book is very realistic about the ups and downs of the entrepreneurial journey. The overwhelming response I have gotten from readers is that it is a not-your-typical-entrepreneur-book. The book is filled with personal vulnerability, evocative content and practical wisdom. There are also special sections set aside throughout the book to address specific entrepreneurial interests: graphic designers, inventors, entrepreneurial moms, teenagers, network marketers, investors, ex-cons, franchise owners, artists, filmmakers, authors and speakers. I also address the typical pressures that the entrepreneurial pursuit places upon family life, especially the first 3-5 years of starting a business. Q. Although this book presents information and inspiration that will help anyone “scratch their entrepreneurial itch,” who will benefit most from reading it? A. It is especially designed for people in the beginning to mid stages of the entrepreneurial pursuit. It is also for someone facing retirement or transitioning from one job to another, walking through the personal reinvention process looking for clarity. However, it is also for the seasoned professional who may want to use this book as a resource, giving it to those starting out. Q. You have a different approach to the development of a business plan. Your book emphasizes the importance a website plays in the success of any business venture. Why should creating a website be the first step in the development of a new business? A. In this day and age, if you don’t have a website you’re not really in business. This is one of the more creative, productive, and less boring ways to do a strategic business plan. You will need to address the nitty gritty aspects of your business in due time, however the process required to develop a website will address all of the legitimate questions you need to address before you can hit prime time with your venture (Who? What? Why? When? Where? How?). Once you have addressed the major questions and developed content, you not only know the all-important answers to those questions, but you now also have a website. The process you endured in the development of a website has forced you to understand what you are all about and how you are going to implement the vision that is burning within. In essence you have now completed the public version of your business plan; your digital brochure. Q. One chapter in your book is devoted to the importance of “branding yourself.” What makes a good brand statement? A. You must determine your main strength(s) and then you can develop a creative spin to that strength. For instance, my company brand is seven words “Dealing With People Who Drive You Crazy!”®. That statement brings a smile to another person’s face. It’s quick. No long explanation. It fits my semi-off-the-wall-sense-of-humor and is aligned with my passion to help people. The brand of a company is like a zebra galloping with a herd of horses. It looks like a horse and runs like a horse – even blending in with the rest of the herd – if someone is only focusing specifically on the activity of running. But the black and white stripes of the zebra cause it to visually stand out, up close or far away. That’s part of the purpose of a brand. There are plenty of goods and services out there, but a five to seven word brand and unique business practices – backed up with excellent customer service – can cause what you are doing to be set apart as something unique in the midst of many others doing the same types of things. Q. What do you want people to walk away with after they have finished reading your book? A. I want readers to grasp the reality that they are in a rare and wonderful fraternity of other entrepreneurs who have their own stories to tell. I also hope that readers appreciate the fact that I gave away a lot of my personal business secrets. I want to send a message that it is important to be a giver. That’s why I love organizations like SCORE, Job Corps, Toastmasters and so many other organizations that provide a framework for people to give away wisdom lessons to others who need a hand helping them up over the fence. desirable the book. Online orders receive the lowest numbered, signed copies. First come, first served. Click Here to order this book right now or check out the Entrepreneur Book and Audio Book Special. The "Next Generation" workbook, designed to connect the contents of the book to young adults (15-26) will be available soon. -- "If Nobody Loves You, Create The Demand!" past international seminars (Sri Lanka). © Copyright, 2009 The Freeman Institute. All rights reserved. Nothing on this page may be used without explicit written permission. pop up displays, portable displays and trade show booths. "press release -- entrepreneur club -- audio book -- MP3 player -- Ipod -- TalkSwitch"